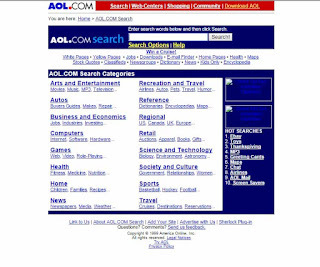 From 1995-1998 the AOL search was involved in several web crawlers. In 1995 they bought the WebCrawler and sold it in 1997. In 1997 they launched NetFind, in 1998 they acquired Netscape and in 1999 they partnered with Excite and started using the Inktomi crawler instead of NetFind. While AOL Search was renamed AOL NetFind in 1997, it was renamed AOL Search after a relaunch in 1999. 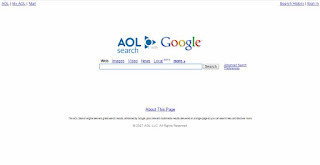 AOL Search has been using Google since 2002. »The AOL search engine has it roots firmly implanted in Web crawling technologies and companies. In its early years,from 1995 to 1999, AOL bought and sold WebCrawler, it launched NetFind, acquired Netscape, and used Excite and Inktomi. In 1999 however AOL relaunched its own search engine under its current name of AOL Search, which used both Open Directory and Inktomi results. June 1995: AOL buys WebCrawler, one of the major crawler-based search engines of its day. November 1996: AOL announces deal to sell WebCrawler to Excite (which itself later gets sold to Infospace in 2001). March 1997: The deal to sell WebCrawler closes. 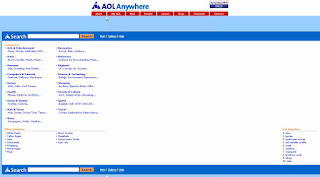 AOL also launches its own branded search engine, NetFind (formerly at http://www.aol.com/netfind/, for nostalgia folks). The service was simply the Excite search engine with an AOL look-and-feel. January 1998: AOL purchases enterprise search company PLS, uses the technology in various ways internally but never continues as an enterprise search player. November 1998: AOL announced a deal to purchase Netscape, which gave it the Netscape-owned Open Directory Project as part of the purchase. At the time, the Open Directory was the major human-powered search engine that rivaled Yahoo and powered results for many services. It has greatly diminished in stature since then, in no small part due to AOL’s neglect and lack of support for the system. August 1999: AOL NetFind drops Excite as a partner and shifts over to being powered by Inktomi’s crawler, through a new deal. 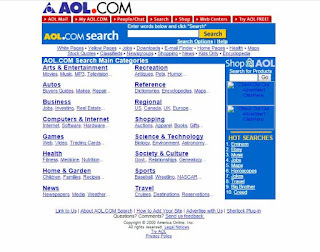 October 1999: AOL does a major relaunch of its search engine and renames it AOL Search (originally at http://search.aol.com while the http://aolsearch.com address is never promoted despite a domain dispute over it that AOL won). The relaunch saw those searching getting served first matches found by AOL editors, then results drawn from the Open Directory, with Inktomi’s crawler-based results kicking in only if the first two tiers failed to have answers. September 2000: AOL cut a deal with the then GoTo (later Overture, later Yahoo Search Marketing) to carry paid search listings. October 2001: AOL no longer tiers results so that Open Directory results come first, then Inktomi results come second. As a result, more of Inktomi’s crawler-based content becomes visible for more queries. By January 2002, the Open Directory results disappear altogether, other than category links. May 2002: Shock waves as Google wins AOL’s paid search listings from Overture and also announces that Inktomi will go in August. That happens, turning AOL largely into Google with an AOL look-and-feel, though it still offers some editorial enhancements. October 2003: AOL renews its agreement with Google. November 2003: AOL acquires the Singingfish multimedia search engine (which later closes) plus makes content from it visible through a new Audio/Video tab that’s part of a general relaunch for AOL Search. September 2004: AOL launches inStore (later AOL Shopping), a shopping service that also offered at Pinpoint Shopping and that’s integrated into AOL Search. Shopping results come from Bizrate. January 2005: AOL relaunches AOL Search, offering Snapshots, short units providing direct answers and information in its search results, that had been in testing since the previous November. 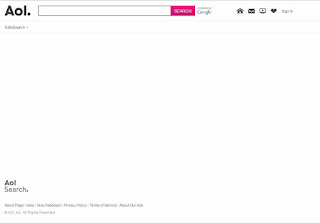 A SmartBox to suggest search queries is unveiled. Local search results powered by FAST are promised (and later come as AOL Local, combining AOL Yellow Pages, CityGuide and MapQuest), and a desktop search tool powered by Copernic is announced. March 2005: AOL releases Pinpoint Travel site, powered through a deal with Kayak. December 2005: AOL and Google agree to renew their deal. Google later purchases 5 percent of AOL as part of the agreement. January 2006: AOL acquires the Truveo video search site, which gathers content by crawling the web. June 2006: Netscape is relaunched as a social news site. July 2006: The AOL Podcasts Search area is launched, powered by Podscope, following an agreement reached in 2005. August 2006: AOL researchers (two are fired later) release search query data that they believe will be anonymous, but it quickly turns out that by looking through the records, individual can be guessed at. A privacy storm erupts. One person is illustrated in a front page New York Times story. AOL also releases a new version AOL Video using both Singingfish and Truveo, plus offering content from partners. 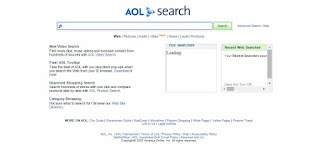 October 2006: AOL relaunches AOL Search with a feature called FullView, designed to make content from vertical search listings (such as multimedia or local listings) appear alongside web search results. April 2007: AOL launches its AOL Search Marketplace, a way for advertisers to buy search ads directly from AOL, rather than having to go through Google. Google ads also continue to be shown. AOL also continues to carry pay-per-call ads through a April 2005 deal with Ingenio. In May, it also buys Third Screen Media, a mobile ad company. 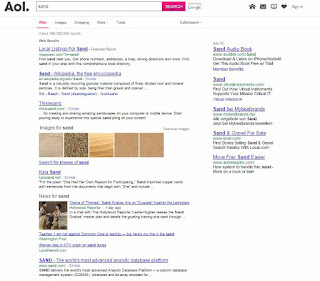 »On August 4, 2006, AOL released a compressed text file on one of its websites containing 20 million search keywords for over 650,000 users over a 3-month period between March 1, 2006 and May 31, intended for research purposes. AOL pulled the file from public access by August 7, but not before its wide distribution on the Internet by others. Derivative research, titled A Picture of Search was published by authors Pass, Chowdhury and Torgeson for The First International Conference on Scalable Information Systems.